Shred Size: 5/32" x 1-3/4"
Dimensions (HxWxD): 30" x 16" x 19"
The Swingline™ DX20-19 shredder is a cross cut shredder suitable for use in departments; it meets the requirements of departments. The cross cut shredder shreds paper, optical media, credit cards, staples, and paper clips. The incorporated Jam Free™ technology enables the Swingline™ DX20-19 shredder to shred continuously. In the case of excessive feeding, the Jam Free™ shredder stops shredding and starts blinking. The Jam Free™ shredder features thermal overload protection. 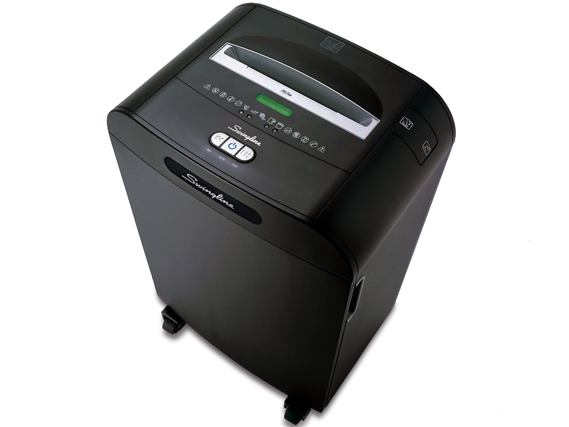 The Jam Free™ shredder automatically goes into sleep mode; minimizing utility costs. The Swingline™ DX20-19 shredder features a wire-frame waste bin; the cross cut shredder indicates when the bin is full. The Swingline™ shredder features automatic oiling and automatic cleaning of the cutting blades; enabling the Swingline™ shredder to constantly perform well. The Swingline™ shredder's cutting blades come with a lifetime warranty. Cut Size 5/32" x 1-3/4"